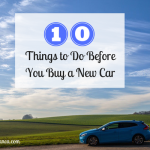 I have mentioned several times on my blog that I love travelling! We have a beautiful world filled with stunning and mesmerising places to visit and I want to see as much of it as I can before I die! 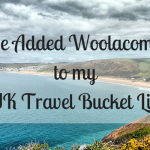 We have, for example, the new seven wonders which includes Machu Picchu which as a Peruvian I have of course visited several times, but I would like to tick off the other wonders in the list too. There are so many countries I want to visit but one in particular that I am very intrigued about and would really like to visit, is Iceland. It was one of the 20 destinations you must visit in 2016 by the Telegraph, and as such puts it high in my list of must see places. I have therefore decided to make a bucket list of great things to do in Iceland so that I’m well prepared before visiting if this happens anytime soon! I have tried to put all the amazing things I want to see and do in Iceland in one main list. After a lot of research I have shortlisted 10 things. I would still probably need a couple of visits to do them all. If you didn’t know, Iceland is a North Atlantic island famous for its hot springs, geysers and active volcanoes. Lava fields cover much of the land and hot water is pumped from under the ground to supply much of the country’s heating. I have to start with the northern lights because they fascinate me a lot! 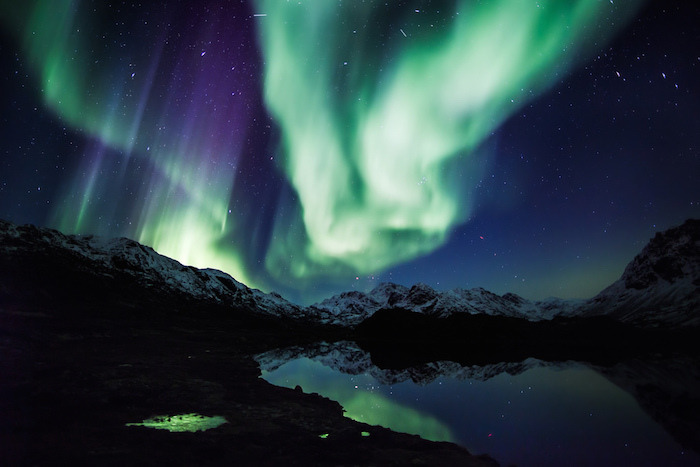 They are a natural light display in the sky, predominantly seen in the high latitude (Arctic and Antarctic) regions. It is possible to see the lights from late September to early April, with October to November and February to March considered optimum periods. It is not easy to find them and you should be very lucky if you do have the pleasure of witnessing them. This free light show is simply, stunning! 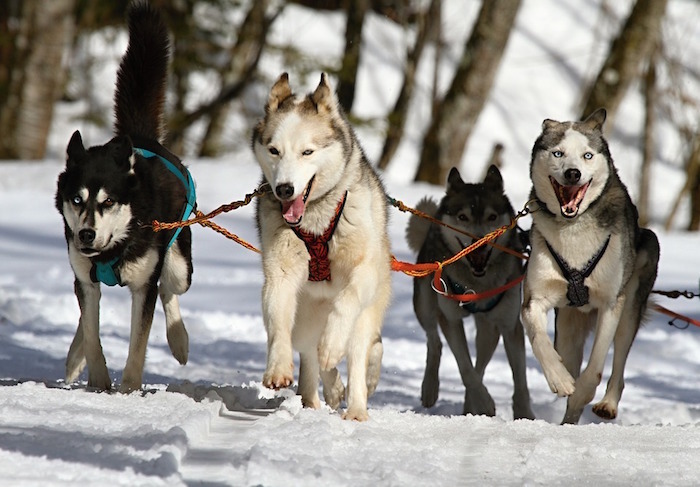 I think dog sledding would be absolutely amazing to do! For sure, it would be a once in a lifetime experience! Although snow is not required (when a specially-built trolley is used), I would prefer an authentic experience so a winter trip would be the desired option. I have been reading about this activity, and even though this sounds difficult to do with kids, I would love to bring the girls along. I would probably make two trips to Iceland: one with the kids and one without. The minimum age for children is 4 years old, so I would need to wait another year for Sienna to turn 4. Just the idea of being surrounded by these lovely huskies is just fantastic! The blue lagoon is an experience not to be missed when visiting Iceland. 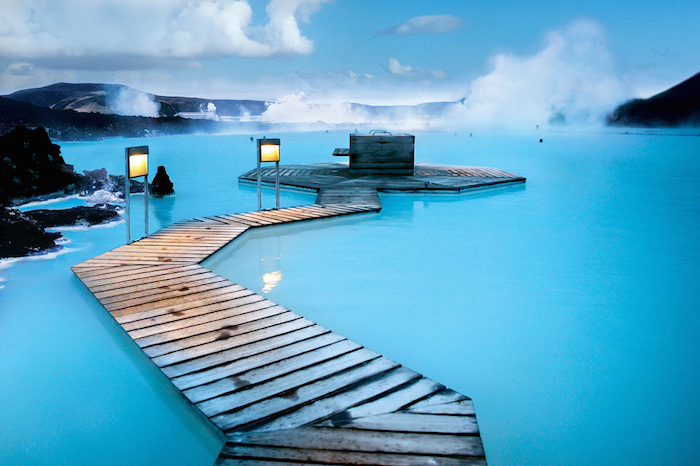 This wonderful place is a geothermal spa and is one of the most visited attractions in Iceland. It is located in a lava field in Grindavík on the Reykjanes Peninsula, southwestern Iceland. It is one of the 25 wonders of the world. The geothermal water originates 2,000 meters below the surface, where freshwater and seawater combine at extreme temperatures. On its way to the surface, the water picks up silica and minerals. Its temperature is generally between 37°C and 40°C (98-104°F). But sometimes fluctuates beyond this range. Isn’t it fascinating? 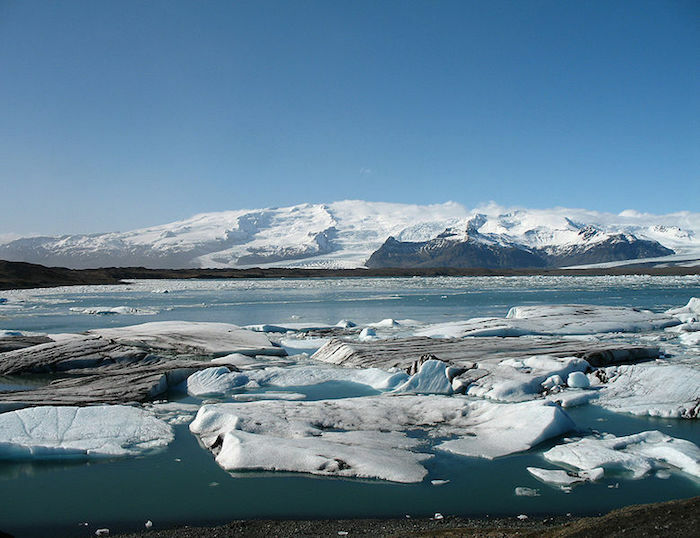 Jokulsarlon is a glacial lake in Iceland, where icebergs which break away from the glacier flow out to sea. I think it would be an unbelievable experience to see these giant chunks of the ice making their way to the sea. This lagoon is a recent one and it is a result of a warming climate. The surface is at sea level and sea water flows into the lagoon at high tide. The Jokulsarlon lagoon is not very wide but it is up to 250 meters deep which makes it the deepest lake in Iceland. I would love to visit this place! 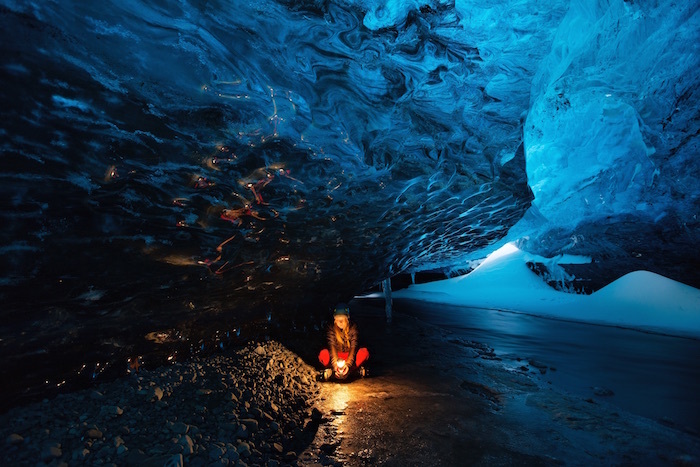 Skaftafell is a beautiful ice cave located on the frozen lagoon of the Svínafellsjökull glacier. It is notable for its rich flora, growing between sand and glaciers, and overall for its amazing and contrasting scenery. There are so many beautiful ice caves which make it harder to choose but after researching it would be advisable to book for Ice cave tours in Iceland in advance, you will then be ready to go and enjoy the experience! Tjorning Lake is for me a perfect picture postcard place for an Instagram lover! I could watch this view for hours. Apparently, it is called a ‘Pond’ by the locals. It echoes with the honks and squawks of over 40 species of visiting birds, including swans, geese and Arctic terns. Feeding the ducks is a popular pastime for the under-fives so I am sure my girls would love to visit. Landmannalaugar is in the highlands of Iceland in Fjallabak nature reserve. 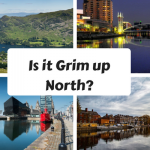 It is a very popular area and can only be reached during the summer months. 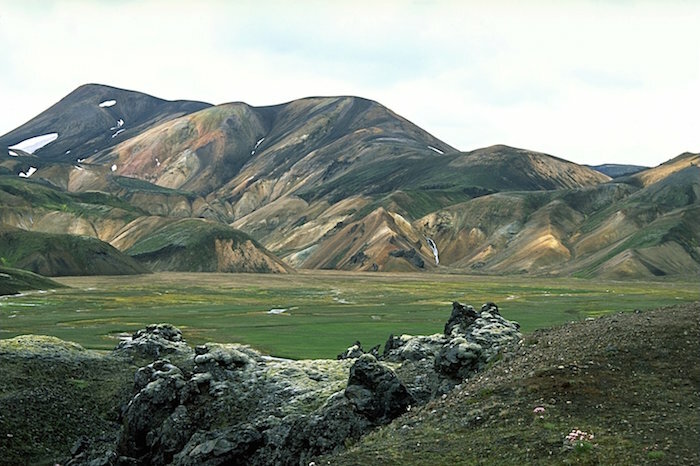 The main attraction in Landmannalaugar are the colourful mountains, which are stunning. Apparently it is like watching a Monet picture in front of your eyes! How amazing is that? Definitely an experience that I wouldn’t like to miss. Reynifjara, near the village of Vik in Myrdalur on Iceland’s South Coast, is widely regarded as the most impressive black sand beach in Iceland. It is definitely an exotic beach to visit. Look at that view! 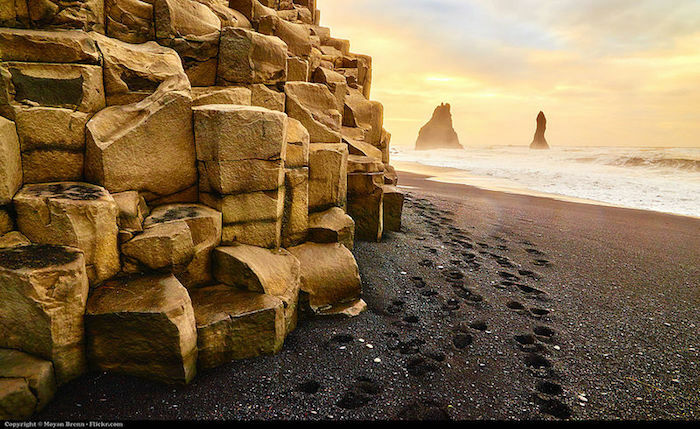 This beach is one of the most photographed sites in Iceland and this is because of the mysterious black basalt Reynisdrangar columns that protrude out of the North Atlantic Ocean and line the beach. It has been said, that apparently the stacks originated from when three trolls, pulling a three-masted ship to shore, were petrified and turned into needles of rock after being caught by surprise by dawn. Interesting right? 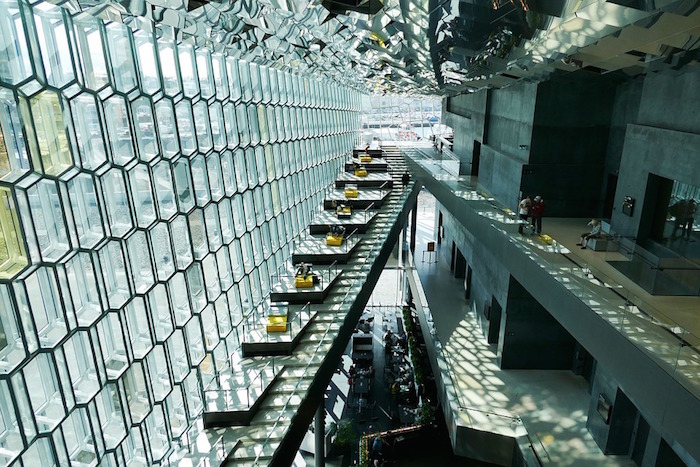 Harpa is located by the old harbour between Reykjavík city centre and the North Atlantic. It is a first class conference centre that has received numerous awards and prizes for outstanding facilities. The design was influenced by Iceland‘s exceptional and dramatic nature. Situated on the boundary between land and sea, the building is a gleaming sculpture reflecting both sky and harbour, as well as the vibrant life of the city. This architecture is just amazing and I would love to be able to get inside and take it all in! The glass facade is beautiful! 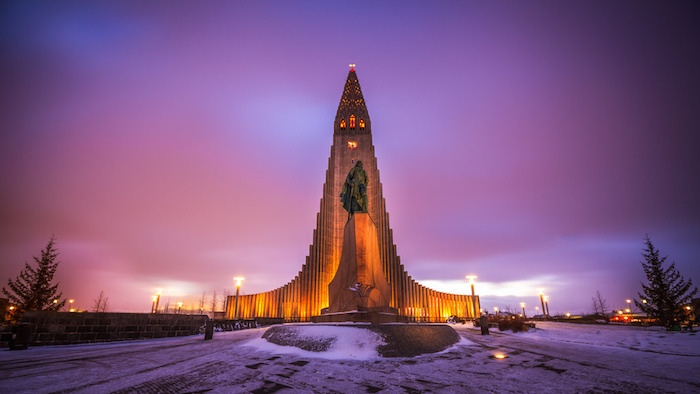 Hallgrimskirkja is the largest and most famous church in Iceland. I would love to go all the way up to the top of the church. 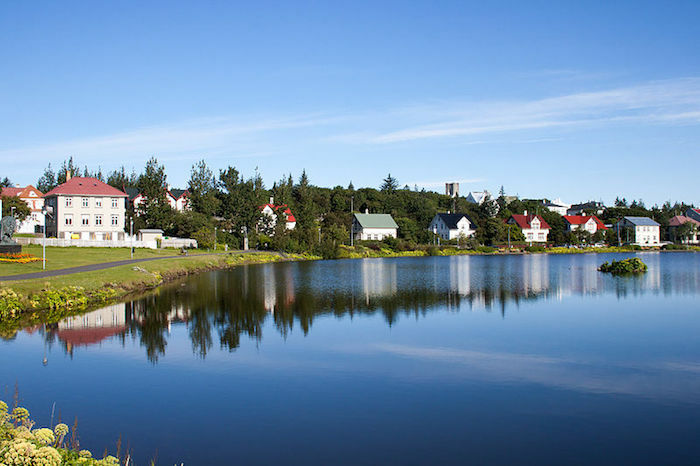 What excites me most is to be able to see the stunning views of Reykjavik as this is what it is most famous for. I think this is a must see if you are in Reykjavik. 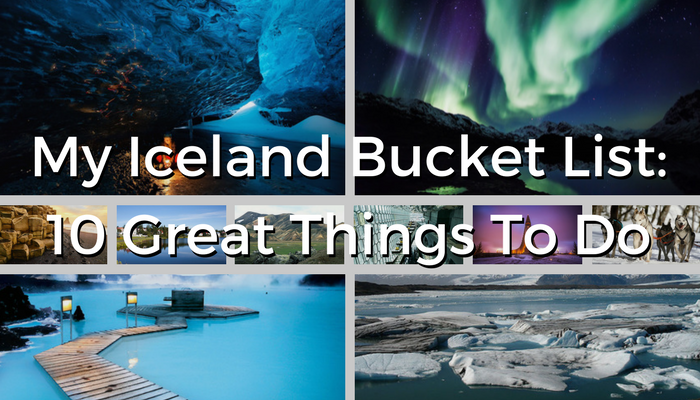 So there you have my bucket list of the 10 things I would love to do in Iceland if I have the opportunity to travel there. It looks like such a wonderful country with plenty of things to do. Also, this is just a short list of the things that you can do, there is plenty more to see. 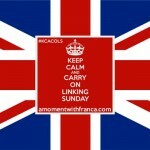 I actually compiled up to 20 things so perhaps i’ll share the remaining items in another blog post. Have you been to Iceland? If so, what places did you visit? 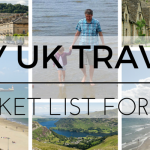 Can you recommend any other activities or things to see? 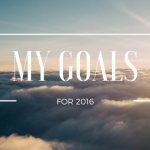 Do you have a bucket list too? I always wanted to see the northern lights, they look so magical! wow! Some of these things look just amazing – especially the lagoon. I’d imagine that’s what heaven is like. I think if I went to Iceland I’d like to do a whale watching cruise. They have a lot of Orca whale pods around Iceland and I’d love to see them in their natural habitat.